One year without supermarkets. One year of planting, watering, weeding, harvesting. One year without sugary cereals, Chinese food, delivery pizza. No processed foods. Everything local, hand-picked. It sounds like quite a daunting challenge: to give up mass-produced edibles and adopt a new food culture eating only what is in season and harvested by your own two hands, or by those of your neighbor. This is exactly what challenge Barbara Kingsolver and her family of four put themselves up to for an entire year, with all the struggles, joys, and recipes recounted in the entertaining and engaging Animal, Vegetable, Miracle. Reading Kingsolver’s Animal, Vegetable, Miracle really encourages you to look at the food you eat, where it comes from, how it is made, and how you can change these factors to enjoy a diet more healthy for you but especially for the environment. The benefits, both personal and environmental, of growing your own food and eating locally are endless – savoring foods when they’re at their peak, reveling in the flavor of produce grown at your own hands, reducing the incidence of cruelty to animals in food production, lowering the number of miles each item of food must travel to reach your plate, supporting local business- and farm-owners, enjoying a more healthy, whole-food lifestyle. And the detriments of the alternative are shocking – to get to your dinner table, the items in a typical American meal have traveled an average of 1,500 miles, through transportation, packaging, warehousing, refrigeration, and other forms of processing. Isn’t is so much more satisfying, healthy, environmentally-concious, inexpensive, and delicious to eat a tomato plucked from your own backyard than one from a pile in the grocery store? So you don’t have room for a vegetable garden at your place? How about trying the local farmer’s market? Not only a farmer’s markets becoming more easy to find every year, they carry the best of the best in-season produce so you don’t have to worry if you’re fruits and vegetables are going to be good. Another great option is to join a CSA, community supported agriculture, where local farmers will deliver food direct to you on a weekly basis. You’ll never know exactly what you’re going to get, but it is guaranteed to be fresh and in-season. To learn more, visit Local Harvest. And to learn more about Kingsolver’s book, to get recipes, and more, visit the Animal, Vegetable, Miracle website. I believe that there are a few authors who really speak to each of us in an extremely personal and almost eery way. Maybe they’re not always on the mark, maybe every piece of work they churn out isn’t our favorite, but in some small way, their writing has made a profound and unparalleled impact on us that will forever burn their names in our hearts and minds. This is how I feel about Barbara Kingsolver. I haven’t been able to fully immerse myself in all of her novels, but Animal, Vegetable, Miracle really moved me in a way that few pieces of nonfiction have ever been able to and so did her collection of short essays entitled Small Wonder. 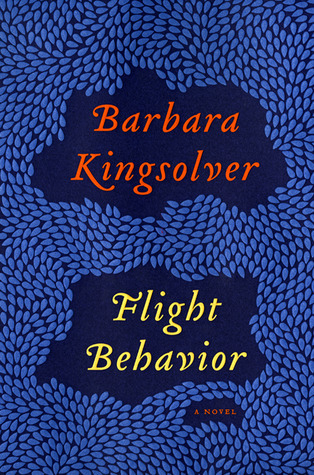 Inspired by the tragic events of September 11, 2001, Kingsolver meditates on a wide range of issues, most of them pertaining to what it means to be an American and what it means to be a parent. Bolstered by Third World parables, stories of foreign travel, anecdotes from her own family life, and a revolutionary sensibility inspired by the likes of Susan B. Anthony, Emma Goldman, and Martin Luther King Jr., Kingsolver has woven a stunning fabric of truth and authenticity that makes the personal political. The thing I find most inspiring about Kingsolver is her optimism, her belief in the goodness of human nature and the potential for change. Nearly all of her ideas ultimately come back to love, peace, and respect. Though she may write on international conflicts, humanitarian crises, the domestic homeless population, or the war on terror, her views are remarkably accessible to all because they are grounded upon the small wonders of everyday life. The love a mother feels for her chid, the comfort of having a family to come home to, the right to live a healthy life – these are the things upon which she frames her larger critiques and interpretations of modern American society. Armed these so-called revolutionary standpoints, Kingsolver’s point is not to inspire guilt about the wasteful and selfish ways of America, but rather to inspire a sense of responsibility to make a change. Despite the many national decisions made with which she entirely disagrees, Kingsolver does not allow these discrepancies between her country’s ideals and her own to diminish her sense of national pride. Instead, she draws upon the same ideas that inspired the founders of our nation as she holds out hope that change is possible. The United States holds the resources and the power to be a role model, to make changes that will improve the whole world, not just our small corner of it. Kingsolver implores us to take that potential and do something productive with it, to create a movement to spend our money more wisely and generously while restoring our sense of contentment grounded in something other than our latest purchase at the mall. Kingsolver dreams of an America that cares just as much about its homeless citizens as those that are safely housed with their families every night. She envisions a country where the local independents can thrive, where unnecessary desires and obsession with consumption takes a backseat to the simple joy of working to put food on the table and fulfillment from relationships and family. As a storyteller, Kingsolver’s imagination is obviously in great form but this ideal US is not some unattainable dreamland in her head. Reading the pieces contained within Small Wonder will make you realize how possible and necessary these changes can be, from the impact of harvesting vegetables in your own garden, to caring about your fellow citizen enough to sacrifice a few dollars of luxury spending. Small Wonder will make you reconsider what you thought you knew, and it will raise questions you may have never thought to ask before. 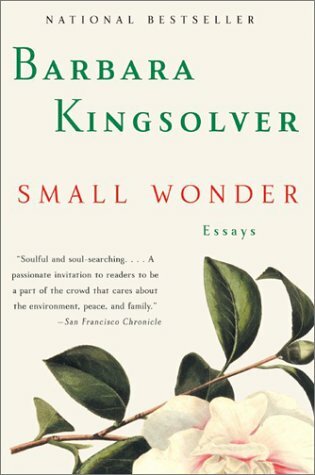 But Kingsolver will also undoubtedly instill in you a sense of hope and the revolutionary spirit to alter your life for the betterment of yourself, future generations, and those in need all around. And she’ll perform this great feat of inspiration by pulling on the most fundamental and universal of human heartstrings: love and family. Mrs. Kingsolver has done it again! I don’t even know how to begin to describe this novel for it is so elaborately written and tells a vast story. 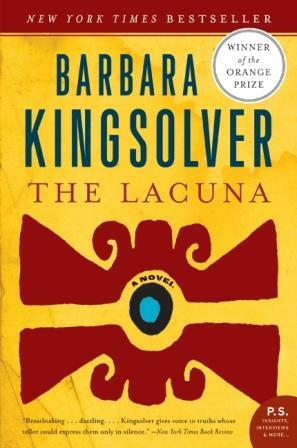 I will admit, as often happens when reading Barbara Kingsolver’s novels, I found it a bit laborious to get through the first 50 or so pages of The Lacuna. But once I read my way further into the stuff of the book, I was completely hooked. The story begins in 1930s Mexico. A young Harrison Shepherd and his mother take up residence with an oil magnate living in Mexico whom the latter hopes to marry. Given the variety of circumstances that Harrison’s mother finds repulsive and fearsome, she off-handedly tells her son to write down everything that happens to them in Mexico for posterity’s sake. From then on out, Kingsolver provides us with Harrison’s journals and correspondence to track his story. Under the tutelage of Leandro, the resident cook in Shepherd’s potential father-in-law’s home, Harrison learns the basics of authentic Mexican cuisine. These skills he applies to plaster preparation when he encounters a formidable Diego Rivera, attempting to complete a two-story mural with sub-par assistance. Shepherd corrects the hired helps’ hopeless ways, making quite an impression upon the famous painter. From there, Kingsolver draws a historic and remarkable life story for Shepherd. The boy works in the home of Diego Rivera and Frida Kahlo, foments a unique relationship with the celebrated female painter, and inadvertently becomes immersed in international political conflicts when exiled Marxist and Bolshevik revolutionary Leon Trotsky takes up residence amongst Diego and Frida. Though he considers himself rather apolitical, Harrison can’t help but find himself in the midst of great political upheaval, especially once he settles in Asheville, North Carolina as an accomplished novelist, only to fall under suspicion of the House Committee on Un-American Activities. His true passions lie in Mexican history, as is evidenced by the content of his compelling and widely-read novels. But Harrison’s life story is such that his stenographer, Mrs. Brown, finds it impossible for the novelist to avoid writing a memoir – especially given his extensive collection of personal journals which would make such a task immensely less daunting. The Lacuna is by no means an easy read and I imagine that, were I to revisit this book in a month or two, I would find thousands of new things to take away from it. Part of the reason I find this novel so compelling is the mere density and complexity of it – the way in which history is so seamlessly woven throughout, how Harrison’s past experiences in place and time craftily dovetail with the present moment, the grand beauty of the language that only further heighten Kingsolver’s storytelling. And a great part of it’s charm is the mystery inherit in the story. As Shepherd repeatedly says “The most important part of a story is the piece of it you don’t know.” Kingsolver proves this to be true by offering only the subtlest of hints at certain important pieces of the grand puzzle of Shepherd’s life. She omits a select few of Harrison’s journals and purposefully conceals periods in his life that prove consequential in his future – all in a captivating effort to demonstrate Harrison’s point that the omissions are often the most crucial points of a story. Complete with historical, social, and political commentary, The Lacuna is undoubtedly one of the most well-crafted and gripping books I’ve picked up in a while. If nothing else, readers can appreciate this novel for the sheer talent required to create something at turns so challenging, entertaining, engaging, and astonishing. This is definitely another one to add to Kingsolver’s ever-growing list of accomplishments! And here are a few tidbits from the novel to give you a little taste of what you can expect from this one.